At the Military Academy, in the presence of Minister of Defence Aleksandar Vulin and Dean of the University of Defence Major General Mladen Vuruna, Major General Goran Zeković handed of over the office to newly appointed Head of the Military Academy Colonel Miroslav Talijan. Addressing the present, Minister Vulin emphasised that emotions or showing emotions are not common for soldiers, but on that day they had an opportunity to see and hear the emotions, because the emotions spoke about how that high educational institution was perceived, and they spoke about the love, respect and passion invested by those who led it, and worked, lived and were educated in it. - I would like to thank General Zeković for the years of honourable and successful service, for the life dedicated to defence of this country, for the life of a dignified and honourable soldier who has something to leave behind – Minister Vulin pointed out, adding that General Zeković left behind numerous results for which he was appreciated and respected. He also congratulated Colonel Talijan, adding that a lot was expected from him, like it is with every man who wore the uniform, but that the expectations in that case were even higher. - His task is to enable this high and honourable institution to grow, to make progress, to adapt to the times. Nothing starts from us, nothing has started from us. Everything that we have done we did by relying on those before us, and we tried to enhance what others had done before us, which is the measure of our success, and to remain worthy of the ones who are yet to come and who will rely on us. Nothing starts from us, and that is the only way that we can pace forward, feeling the value and greatness of the country, people and institution for which we work and where we belong – the minister of defence stressed. According to his words, the history of Serbia is a history of the fight for freedom, but the fight for freedom led to wars. - The Serbian history is a history of the fight for freedom, of wars and preparations for the wars. That is why this great home, this important institution, this beloved institution serves in our armed forces and our people as our constant preparation and everlasting reminder of the fight for freedom – Minister Vulin said adding that freedom, which was the reason of the existence of our people, was not something that was once won and never again lost. He stressed that only the everyday life dedicated to the fight for freedom was a successful and fulfilled life, and that the people who could accept to live in non-freedom was not the people that was remembered in the history. Dean of the University of Defence Major General Mladen Vuruna stressed that during the three years of service of General Zeković as the Head of the Military Academy, that high education establishment had achieved a lot – it established the Military High Vocational School, enhanced the Centre for Simulations and Distance Learning and accredited all programmes of study at all the levels of military education and professional advancement. - In that period, the Military Academy had an opportunity to be commanded by a man of rich knowledge and military experience – General Vuruna said, underlying that General Zeković was an exceptional professional always dedicated to his work. He said that General’s office as the Head of the Military Academy was going to be handed over to Colonel Talijan, an officer who had matured in the Military Academy and the National Defence School. “On the basis of all his results achieved so far” – said General Vuruna – “I am confident that Colonel Talijan will not only successfully command and lead the Military Academy, but add additional value to it. Speaking to the gathered, General Zeković pointed out that he was honoured to have managed an institution such as the Military Academy. He underscored that the results behind him were the fruit of a team work of all the employees of that institution. 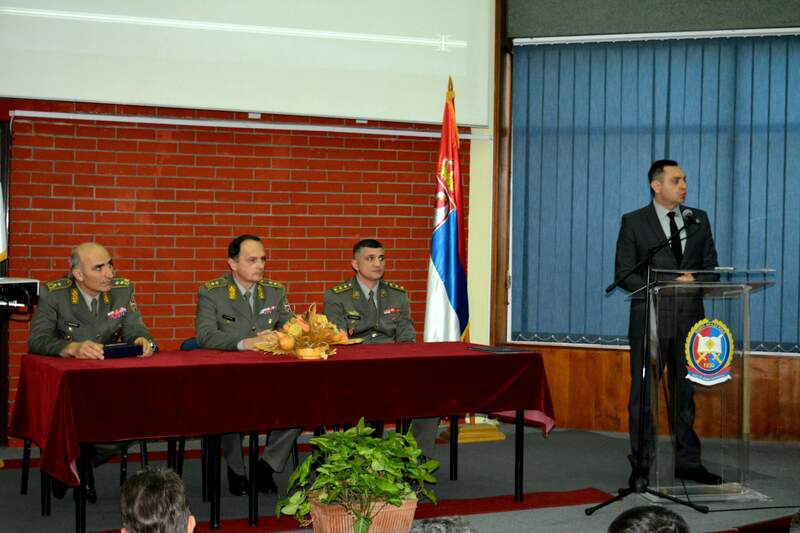 - Today, the Military Academy and National Defence School have 17 departments, and no other university in Serbia has such treasure – he said stressing that it was something to cherish and develop in the future. Colonel Talijan emphasised that the new duty represented for him a pleasure, because he would be leading an institution where he had been educated and that had enabled him to accomplish his dream of becoming an officer. - At the same time, I have qualm about the great challenge that we are facing, and that is the need to not only maintain the Military Academy, that has been successfully carrying out its mission for more than two centuries, but to enhance and develop it in terms of organisation and function – said the newly appointed Head of the Military Academy, underlying that the process needed to be started by thorough consideration of the past experiences and critical analysis of the reality. Today’s hand over was an opportunity for General Vuruna to present General Zeković with the plague of the University of Defence for the contribution to development of military education. 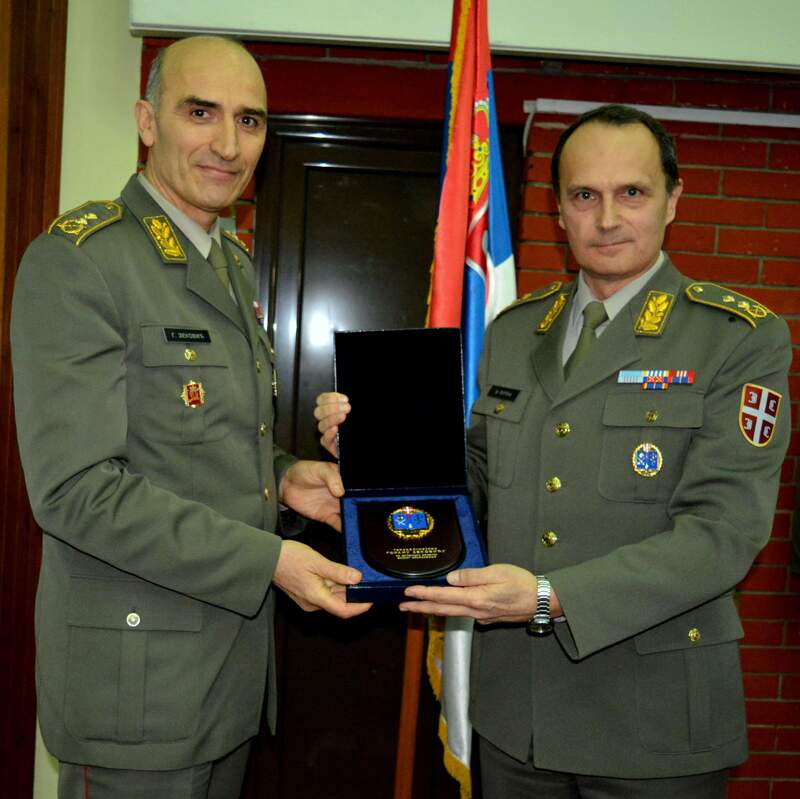 Colonel Talijan, who was appointed pursuant to a Decree of the President of Serbia Aleksandar Vučić, had headed the National Defence School, while General Zeković, after more than three decades of the military service, takes his retirement.